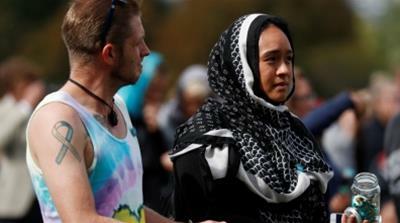 Christchurch, New Zealand – A nationwide moment of silence was observed in New Zealand on Friday – ushered in by the Muslim call to prayer – a weekafter 50 people were killed and scores of others wounded in an attack on two mosques. Al Noor was one of the two places of worship targeted in the city during the worst mass shooting in New Zealand’s modern history, allegedly carried out by Australian-born Brenton Tarrant, along with the Linwood mosque. Imam Gamal Fouda, prayer leader at the Al Noor mosque who was present during last week’s attack, told mourners in Christchurch he “saw hatred and rage in the eyes of the terrorist”. Fouda called on New Zealand and governments “around the world” to “bring an end” to hate speech saying the attack on Friday was the result of “anti-Islamic and anti-Muslim rhetoric by some political leaders, some media agencies, and others”. “Last week’s event is proof and evidence to the entire world that terrorism has no colour, has no race, and has no religion,” Fouda said. Prior to Fouda’s speech and the Friday prayers, Ardern quoted the Prophet Muhammad during a brief address to the crowd. According to local council estimates, as many as 5,000 Muslims attended the prayers, nearly a tenth of the country’s total Muslim population. Participant Imran Khan, who arrived from Auckland on Friday morning with four friends, said it was important to be present as a “show of support” for his friend Ashraf Azad’s family. Azad was one of the 50 shot dead last week, in what Ardern has labelled a “terrorist” attack. “[But] the support we are getting from other groups in society is unbelievable… It shows that religion is not everything, it’s the love and the unity that matters, people are standing up for that,” he added. Others, such as Christchurch local and regular Al Noor attendee Ahmed Osman, said the event proved that Friday’s gunman had failed to achieve his self-stated aim of sowing societal division. “The thing has happened but we will always be together … From now on we are going to be more supportive of each other and more together; we are looking forward now,” Osman, whose uncle was among those killed on Friday, told Al Jazeera. “Today is a special day for our hearts… The people of Christchurch will stand together,” he added. A “March for Love” rally is also scheduled to take place in Christchurch on Saturday. Thousands of people are expected to attend.